Some movies occupy a class all their own. Disney’s classic animated film, Bambi, tops that list. This year marks 75 years since it’s debut. To celebrate, Disney has released a Bambi Signature Collection version of this timeless childhood film. The Collection release includes a variety of new bonus material, including recordings of Walt Disney discussing the challenges and triumphs during the production of “Bambi;” deleted scenes and characters; stories and effects that “Bambi” had on the Studio, other films and artists; and much, much more. Additionally, the Digital HD release includes an exclusive, heartfelt feature on the incredible artist, Tyrus Wong, who inspired the film’s soft watercolor backgrounds and beautiful palette. Right now, inside specially marked packages, you can get a Tyrus Wong lithograph, depicting Bambi and Thumper. It’s labelled a collectible. While it’s very pretty, I am not sure I would put it in the ‘collectible’ category exactly. If you are a Disney Movie Rewards collector, there’s a ladies tank top with a similar image on it you can get right now. That I might be down with. As classic as Bambi is, if it was released for the first time today, I am pretty sure it would come with some sort of parental guidance warning. Bambi’s mother being killed in the first few minutes of the film would surely illicit gasps of horror and the clutching of pearls. Seventy-five years ago, however, nobody thought much of it. As upsetting as that may be to some of the younger viewers, I really hope nobody ever slaps a warning label on it. There are some far, far worse things for kids to see out there. 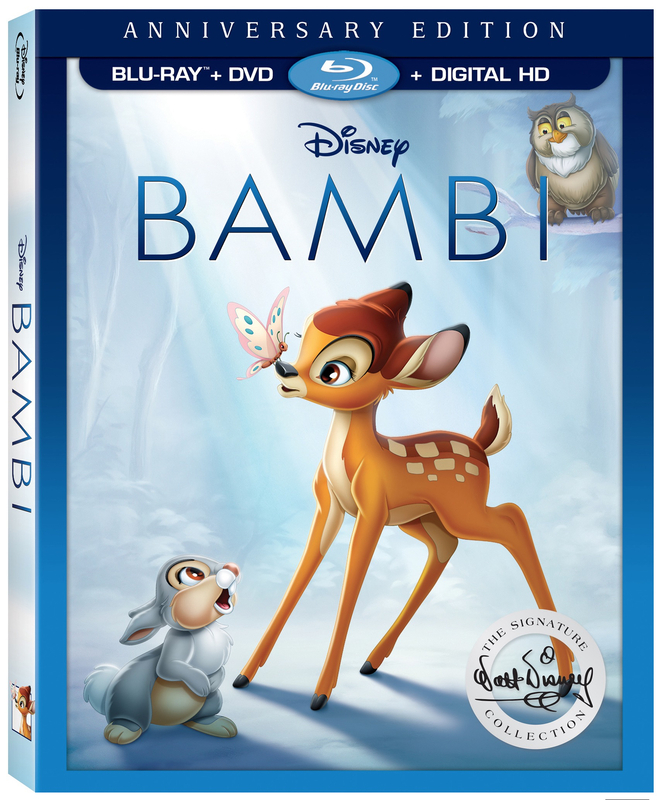 Those great folks over at Disney would like one of my readers to have their very own copy of Bambi Signature Collection. Enter using the Rafflecopter form below. Contest open to Canadian residents only. Not responsible for lost or misdirected entries. No cash value. Odds of winning will depend on the number of eligible entries received. Contest closes June 26, 2017 11:59 pm ET. Good luck! 29 Responses to "Disney’s Bambi Signature Collection Review & Giveaway"
Yes,Bambi did traumatize me as a kid and still does. No Bambi didn't traumatize me when I was a kid. It did and I haven't watched it since then! No, but it did make me sad, at certain points. I don't remember it much as a child, but I do remember crying at the end! It made me sad as a child, but was still watched and enjoyed! No, it didn't traumatize me. Nope it didn't traumatize me! I was traumatized by it! No, Bambi did not traumatize me as a kid. It was a good movie. No, it did not traumatize me! I hardly remember it, so it didn't traumatize me. It did just a little bit. I was able to still grow up as a functioning adult but still have issues, lol. ;) Nahhhh. No problems from it except being sad. I live in Texas with hunters. No, because I didn't watch it until I was much older! No, I don't think Bambi traumatized me as a kid. But I think I was a bit older when I saw it for the first time.